We definitely have our fair share of scallop-hemmed skirts (and shirts and shorts and tops and, well, you get the point) hanging in our closets. There's something about that ultra-femme, ladylike line that really jazzes up an ordinary hem. But, as much as we love a good scallop, we can't say we've ever thought of translating this trend to our makeup — that is, until we got a look at this cool tutorial that Lauren Conrad and the team over at The Beauty Department whipped up recently. We wouldn't really call this look, which requires a stencil, some bright liner, a thin brush, and a really steady hand, totally DIY. This looks like the kind of makeup experiment best done with a few girlfriends to try and get it right. 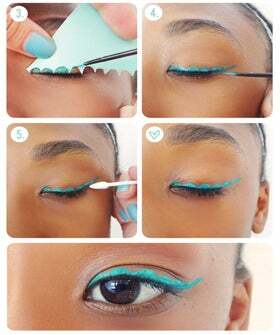 What do you think: Is scallop liner next on your makeup must-trys, or is this funky design a pass?